Test your creativity behind the counter of a food truck overrun by zombies. 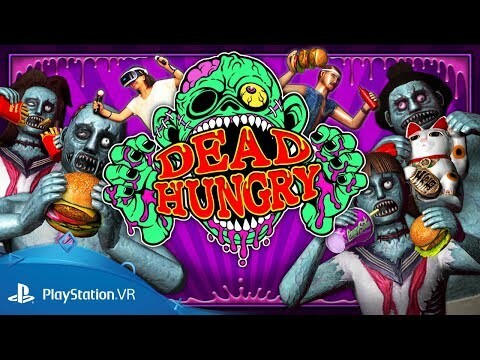 Dead Hungry is a fast and frantic VR game where your weapons of choice are burgers, pizza, and fries! Influenced by classic horror games and B-movie favorites, Dead Hungry combines "decomposed" visuals with arcade-style action for a simple yet addictive experience. Turn zombies back into humans by loading up huge hamburgers and hurling them to the grateful undead. Don't just settle for traditional toppings like lettuce and cheese, though. In Dead Hungry, anything that you can pick up, you can put in a burger! Out of ketchup? Toss the bottle in! Need some quiet time? Feed the zombies your radio. In Dead Hungry, you are a disciple of the Holy Tiger school of fast food preparation, sent to save the zombified citizens of a slightly off-kilter version of Kyoto, Japan. Armed with burgers, soda, and much more, your mission is to sate their hunger and restore their humanity! Zombies can prove impatient and unruly customers, but fear not! The mystical power of your Tiger's Roar gloves renders anything they touch palatable--meaning anything you can pick up is fair game for a burger. You also have an endless supply of Crazy Soda, which will satisfy even the most demanding customers for a few seconds. Toss them a drink when you need time to think. Reduce the zombies' Hunger Points to zero to transform them back into the businessmen, schoolgirls, and sumo wrestlers that keep society running smoothly. Different zombie types have different appetites, and your well-honed senses will allow you to see just how hungry they are. As your customers grow in number and variety, you'll need to dish out portions that send everyone home alive and happy, including you! Anything you can pick up can be used in a burger or fed directly to a zombie. Experiment with everything around you. Your burgers are named based on the type and amount of ingredients inside. How many variations can you find? Take in the sounds of meat sizzling, soda flowing, and the growls of approaching zombies. Use your ears as well as your eyes to find your rhythm and master your art. Want to change the background music? Just grab a cassette and toss it into the state-of-the-art radio! Prefer silence? Feed the tapes and radio to the zombies! Buy PixelJunk VR Dead Hungry on PS4.